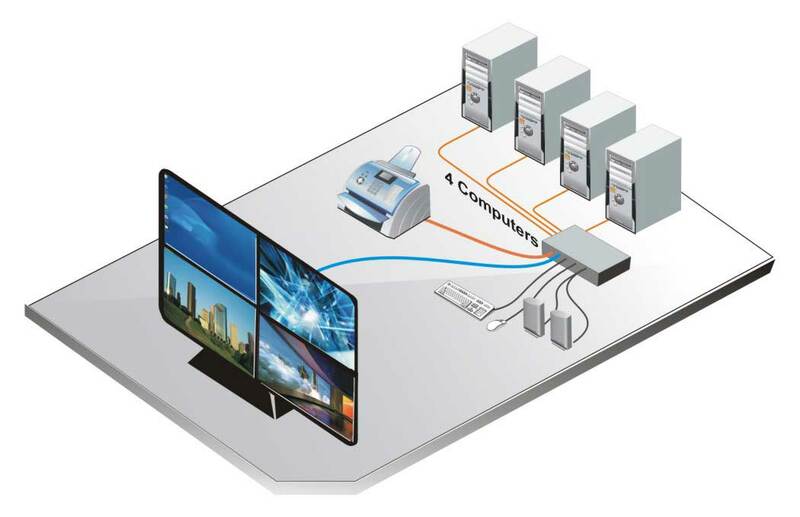 The Rose Electronics QuadraVista HDMI (QV-4kvmHDMI) is a flexible and powerful multi-viewer HDMI KVM with the capability to control and monitor up to four HDMI video sources on a single display. Each of the quadrants can be adjusted and positioned to any size or location on the display. The Rose Electronics QuadraVista HDMI can be accessed locally, sending ASCII commands using HyperTerminal, or from a third party controller for control over IP. The Rose Electronics QuadraVista HDMI provides simultaneous support for HDMI and DVI video. The video features that the QuadraVista HDMI incorporates are, automatic sensing of the input signal, Picture-in-Picture, video loss detection and automatic output monitor resolution detection. Each of the display windows can be resized, repositioned, swapped, or locked to the present window layout. These functions are easily performed with a simple mouse click. Question: I would like to have the manual for this device, were can I get it? Answer: Thank you for your inquiry. We have uploaded the QV-4KVMHDMI manual to the product's page for your convenience. Question: Is this their new product? Answer: Thank you for your inquiry. The Rose Electronics QV-4KVMHDMI HDMI KVM is a newer product, but it has been available for a few years. Question: Are the cables included?